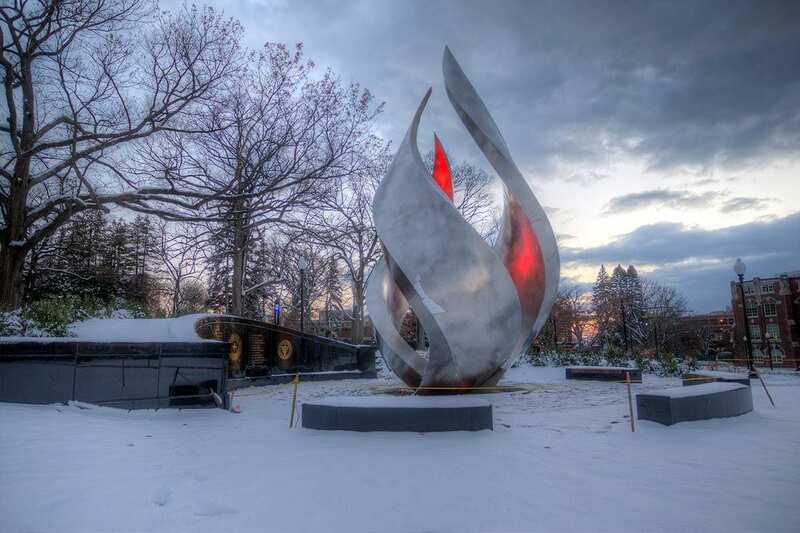 A view of the Calabria Plaza and its 33-foot, stainless steel flame on a winter evening. The Calabria Plaza, the newest addition to the campus landscape, features a stainless-steel flame that rises 33 feet above the Slavin Center lawn. Illuminated at night, it is a physical representation of the Providence College motto, Veritas — Truth — symbolized by a torch. The plaza was a gift from Joseph M. Calabria ’65 and his wife, Sugar. They are longtime philanthropic supporters of PC athletics, but this gift has different meaning. The black granite plaza was completed in December. It includes benches for reflection and a polished wall on which are engraved the names of the Dominican saints, the College’s Alma Mater, and the Dominican and College seals. The cornerstones are engraved “1917” and “2017,” the year of the College’s founding and its centennial, to indicate PC’s transition to its second century. The flame’s height represents the number of years Jesus lived on earth before his crucifixion. Its three tongues of flame represent the Trinity. The back wall is 7 feet high, a significant number throughout Scripture. The pattern of stones on the plaza base calls to mind the halo of St. Dominic, which the Calabrias learned about from Rev. Richard A. McAlister, O.P., professor emeritus of art, while viewing the work of Very Rev. Thomas McGlynn, O.P. ’77Hon., the late Dominican sculptor whose collection is housed at the College. Religious symbolism was important to the Calabrias, who wanted the plaza and flame to be symbols for light and truth, the College’s Catholic and Dominican identity. “It’s a place where students can come to sit and consider truth, to think about why they have been brought here in life, and a spot where alumni can think back on their experiences at PC and consider the value they got from the education here,” said Calabria, who is a member of the PC Board of Trustees. 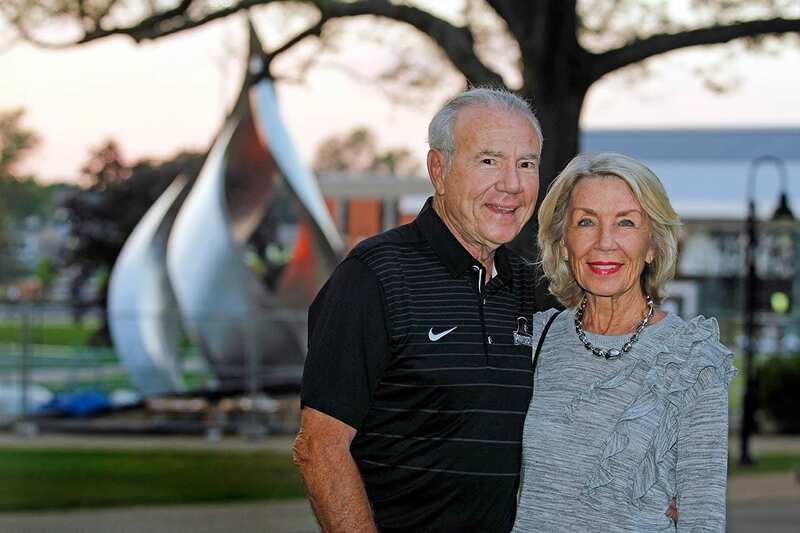 Joseph M. Calabria ’65 and his wife, Sugar, with the flame behind them. The Calabrias live in Boulder, Colo., where they own a business, CounterTrade Products, Inc., which sells IT products and services and employs 60 people. Several years ago, during one of their regular visits to PC, the couple realized that while the torch symbol is represented in classrooms and buildings, there was no actual torch on campus. The College asked Stephen Forneris ’90, an architect who designed the Ruane Friar Development Center being built near Alumni Hall, to provide ideas. He produced sketches and created replicas of the proposed flame with a 3D printer. 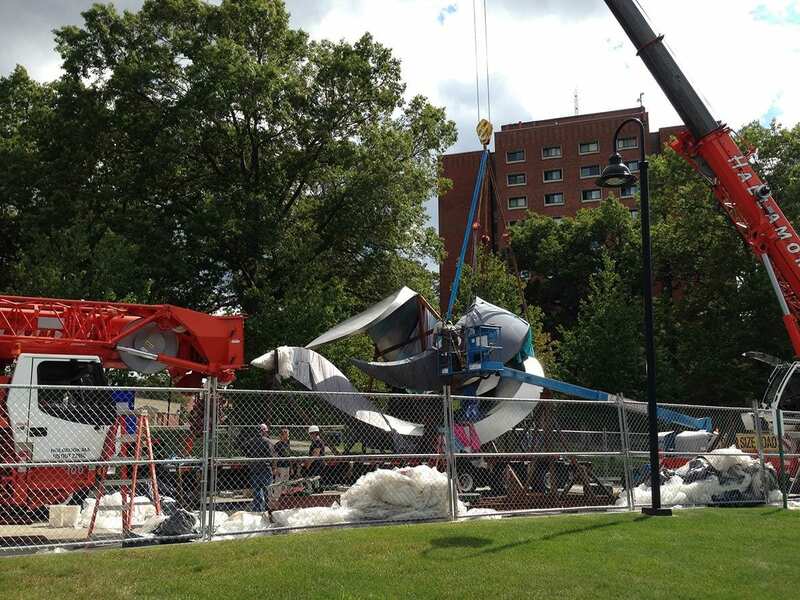 Forneris’ design was modified by sculptor Brian Hanlon, of Hanlon Sculpture Studios in Toms River, N.J., who also is working on the Ruane Friar Development Center. Hanlon is creating statues of Friar basketball coaches Dave Gavitt ’89Hon. and Joe Mullaney ’65Hon. & ’98Hon. for the center, which will include a basketball practice facility and a new Center for Career Education and Professional Development. Hanlon selected a foundry in China to manufacture the flame. When complete, it was shipped in three pieces across the Pacific Ocean to Long Beach, Calif., then transported to Providence by truck. The flame was assembled in eight hours on a Saturday in September with the help of two 60-ton cranes, then hoisted onto its base and anchored by 31 bolts. It weighs 18,000 pounds — nine tons — and measures 18 feet at its widest point. The engraved black granite for the plaza wall was manufactured in China, too. The plaza was designed by SLAM Collaborative, with structural work by Michael Ludvik. The lighting, which includes glass stones at the flame’s base that resemble embers, was by HLB Lighting Design in Boston. The plaza’s slogan, “The Search for Veritas Begins Here,” is engraved in the wall. It was suggested by Steven R. Napolillo ’98, senior executive associate athletic director for external relations. Cranes were used to hoist the flame onto its base in September. It weighs 18,000 pounds — nine tons — and measures 18 feet at its widest point. Calabria grew up in Reading, Pa., the grandson of Italian immigrants. He first heard about Providence College in 1961 while watching the men’s basketball team win the National Invitational Tournament. After seeing the College mentioned again in a college brochure, he visited campus, liked what he saw, and submitted his application. He majored in physics. Throughout his college years, Calabria’s family struggled financially. During his senior year, his father was laid off from his factory job as a needle straightener. It wasn’t an unusual circumstance for a PC student at the time. What kept students in school? After graduation, at his mother’s urging, Calabria applied for a job at IBM in his hometown. He didn’t want to accept the position, but his mother told him, “‘Giuseppe! Apple pie, motherhood, the American flag, and IBM — you have to work there!” So he did. It wasn’t long before Calabria was able to start his own business. From 1977-1983, the family lived in Connecticut, close enough to campus to attend athletics events with their children — one of whom, Sharon Calabria Norwell ’93, chose to attend PC, too. Calabria is pleased with the finished plaza. “I really think it’s meant for the campus,” he said.